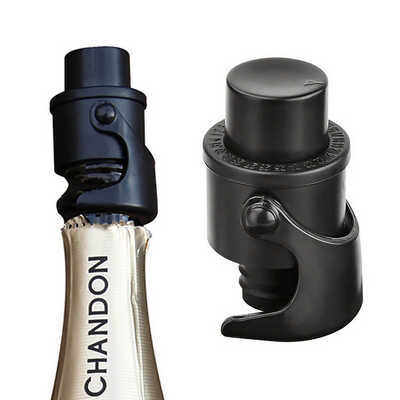 Plastic Push-Type Vacuum Champagne Stopper. 1. ABS plastic, siullica gel for food grade. 2. Pump and stopper in 1. 3. Preserves the fizz. 4. Turn the top to mark the date. 5. Patent item. Item Size: 38 mm x 38 mm x 65 mm. Package: plastic bag + clear plastic box. Colour Range: black. Decoration Area: 20 mm W x 15 mm H(front body), 22 mm W x 15 mm H(on latch). Decoration Methods: Pad Printing, 4CP digital printing. Price includes : 7 Day Lead Time - Pad Printed. Setup is not included, please ask for a final price from your sales representative.